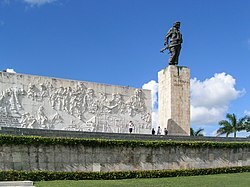 ^ Partido Unido de la Revolución Socialista de Cuba, a.k.a. PURSC. ^ Taibo 1999, p. 267. ^ Kellner 1989, p. 69-70. ^ Anderson 1997, p. 526-530. ^ Che Guevara's Final Verdict on the Soviet Economy by John Riddell, Centre for Research on Globalization, June 13, 2008. ^ CIA Debriefing of Félix Rodríguez (PDF). National Security Archive. 1975-06-03. Alekseev, Aleksandr（1984年10月）. "Cuba después del triunfo de la revolución"（"Cuba after the triumph of the revolution"）. Moscow: America Latina. Almudevar, Lola（2007年10月9日）. "Bolivia marks capture, execution of 'Che' Guevara 40 years ago". San Francisco Chronicle. Anderson, Jon Lee（1997）. Che Guevara: A Revolutionary Life. New York: Grove Press. ISBN 978-0-8021-1600-0. Bamford, James（2002）. Body of Secrets: Anatomy of the Ultra-Secret National Security Agency（Reprint edition）. New York: Anchor Books. ISBN 978-0-385-49908-8. BBC News（2001年1月17日）. "Profile: Laurent Kabila". Accessed April 10, 2008. BBC News（2001年5月26日）. 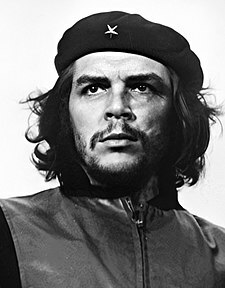 Che Guevara photographer dies. Accessed January 4, 2006. BBC News（2007年10月9日）. "Cuba pays tribute to Che Guevara". BBC News, International version. Beaubien, Jason. Cuba Marks 50 Years Since 'Triumphant Revolution'. NPR: All Things Considered, Audio Report. 2009. Ben Bella, Ahmed（1997年10月）. "Che as I knew him". Le Monde diplomatique. mondediplo.com. Accessed February 28, 2008. Bockman, USMC Major Larry James（1984年4月1日）. The Spirit of Moncada: Fidel Castro's Rise to Power 1953-1959. United States: Marine Corps Command and Staff College. Casey, Michael. Che's Afterlife: The Legacy of an Image. Vintage. 2009. ISBN 0307279308. Castañeda, Jorge G (1998). Che Guevara: Compañero. New York: Random House. ISBN 978-0-679-75940-9. 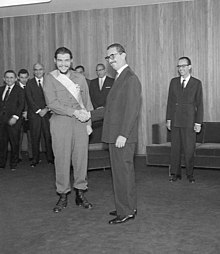 Castro, Fidel（editors Bonachea, Rolando E. and Nelson P. Valdés; 1972）. Revolutionary Struggle 1947–1958. Cambridge, Massachusetts and London: MIT Press. ISBN 978-0-262-02065-7. DePalma, Anthony (2006). The Man Who Invented Fidel: Castro, Cuba, and Herbert L. Matthews of the New York Times. New York: Public Affairs. ISBN 978-1-58648-332-6. Dorfman, Ariel（1999年6月14日）. Time 100: Che Guevara. Time Inc.
Dorschner, John and Roberto Fabricio (1980). The Winds of December: The Cuban Revolution of 1958. New York: Coward, McCann & Geoghegen. ISBN 978-0-698-10993-3. D'Rivera, Paquito（March 25, 2005）. "Open letter to Carlos Santana by Paquito D'Rivera". Latin Beat Magazine. Accessed June 18, 2006. Dumur, Jean (interviewer)（1964）. L'interview de Che Guevara（Video clip; 9:43）. Gálvez, William (1999). Che in Africa: Che Guevara's Congo Diary. Melbourne: Ocean Press, 1999. ISBN 978-1-876175-08-5. Gómez Treto, Raúl（1991年春季）. "Thirty Years of Cuban Revolutionary Penal Law". Latin American Perspectives 18（2）, Cuban Views on the Revolution. 114-125. Gott, Richard. Cuba: A New History. Yale University Press. 2004. ISBN 0300104111. Gott, Richard（2005年8月11日）. "Bolivia on the Day of the Death of Che Guevara". Le Monde diplomatique. Accessed February 26, 2006. Grant, Will（2007年10月8日）. "CIA man recounts Che Guevara's death". BBC News. Accessed February 29, 2008. Guevara, Ernesto "Che"（1995）. Motorcycle Diaries. London: Verso Books. Guevara, Ernesto "Che"（editor Waters, Mary Alice）（1996）. Episodes of the Cuban Revolutionary War 1956–1958. New York: Pathfinder. ISBN 978-0-87348-824-2. Guevara, Ernesto "Che"（1965）. "Che Guevara's Farewell Letter". Guevara, Ernesto "Che"（1967a）. "English Translation of Complete Text of his Message to the Tricontinental"
Guevara, Ernesto "Che"（1967b）. "Diario (Bolivia)". Written 1966–1967. Guevara, Ernesto. Che: The Diaries of Ernesto Che Guevara. Ocean Press. 2009. ISBN 1920888934. Guevara, Ernesto "Che"（1972）. Pasajes de la guerra revolucionaria. Guevara, Ernesto "Che"（translated from the Spanish by Patrick Camiller; 2000）. The African Dream. New York: Grove Publishers. ISBN 978-0-8021-3834-7. Guevara Lynch, Ernesto (2000). Aquí va un soldado de América. Barcelona: Plaza y Janés Editores, S.A. ISBN 978-84-01-01327-0. Hall, Kevin (2004). "In Bolivia, Push for Che Tourism Follows Locals' Reverence". Common Dreams. commondreams.org. 2008年9月15日查閱. Haney, Rich (2005). Celia Sánchez: The Legend of Cuba's Revolutionary Heart. New York: Algora Pub. ISBN 978-0-87586-395-5. Hari, Johann（2007年10月6日）. "Johann Hari: Should Che be an icon? No". The Independent. Hart, Joseph (2004). Che: The Life, Death, and Afterlife of a Revolutionary. New York: Thunder's Mouth Press. ISBN 978-1-56025-519-2. Ireland's Own（2000年8月12日）. From Cuba to Congo, Dream to Disaster for Che Guevara. Accessed January 11, 2006. Kellner, Douglas. Ernesto“Che”Guevara（World Leaders Past & Present）. Chelsea House Publishers (Library Binding edition). 1989: 112. ISBN 1555468357. Kornbluh, Peter（1997）. Electronic Briefing Book No. 5. National Security Archive. 2007年3月25日查閱. Lacey, Mark（2007年10月26日）. "Lone Bidder Buys Strands of Che's Hair at U.S. Auction". New York Times. Lacey, Mark（2007年10月9日）. "A Revolutionary Icon, and Now, a Bikini". The New York Times. Lago, Armando M（2005年9月）. "216 Documented Victims of Che Guevara in Cuba: 1957 to 1959PDF (24.8KB)". Cuba: the Human Cost of Social Revolution.（Manuscript pending publication.）Summit, New Jersey: Free Society Project. McLaren, Peter. Che Guevara, Paulo Freire, and the Pedagogy of Revolution. Rowman & Littlefield. 2000. ISBN 0847695336. Murray, Edmundo（November-December 2005）. "Guevara, Ernesto [Che]（1928–1967）". 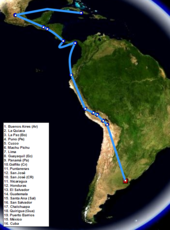 Irish Migration Studies in Latin America（www.irlandeses.org）. Niwata, Manabu, Mainichi correspondent（October 14, 2007）. Aide reveals Che Guevara's secret trip to Hiroshima. HDR Japan. O'Hagan, Sean（2004年7月11日）. "Just a pretty face?". The Guardian. 2006年10月25日查閱. Radio Cadena Agramonte, "Ataque al cuartel del Bayamo". 2006年2月25日查閱. Ramírez, Dariel Alarcón. Le Che en Bolivie. Paris: Éditions du Rocher. 1997. ISBN 2-268-02437-7. Ratner, Michael. Che Guevara and the FBI: The U.S. Political Police Dossier on the Latin American Revolutionary. Ocean Press. 1997. ISBN 1875284761. Rodriguez, Félix I. and John Weisman (1989). Shadow Warrior/the CIA Hero of a Hundred Unknown Battles. New York: Simon & Schuster. ISBN 978-0-671-66721-4. Ryan, Henry Butterfield (1998). The Fall of Che Guevara: A Story of Soldiers, Spies, and Diplomats. New York: Oxford University Press. ISBN 978-0-19-511879-7. Sandison, David. The Life & Times of Che Guevara. Paragon. 1996. ISBN 0752517767. Selvage, Major Donald R. – USMC（1985年4月1日）. Che Guevara in Bolivia. Globalsecurity.org. 2006年1月5日查閱. Snow, Anita（2007年10月8日）. "Castro Pays Homage to Che Guevara". ABC News. Taibo II, Paco Ignacio. Guevara, Also Known as Che. St Martin's Griffin. 2nd edition. 1999: 691. ISBN 0312206526. Time Magazine（1970年10月12日）. "Che: A Myth Embalmed in a Matrix of Ignorance". Time Magazine cover story（1960年8月8日）. "Castro's Brain". U.S. Army（1967年4月28日）. Memorandum of Understanding Concerning the Activation, Organization and Training of the 2d Ranger Battalion – Bolivian Army. 2006年6月19日查閱. U.S. Department of State. Foreign Relations, Guatemala, 1952–1954. Office of Electronic Information, Bureau of Public Affairs. 2008年2月29日查閱ˋ. Vargas Llosa, Alvaro（2005年7月11日）. "The Killing Machine: Che Guevara, from Communist Firebrand to Capitalist Brand". The Independent Institute. 2006年11月10日查閱. "World Combined Sources"（2004年10月2日）. "Che Guevara remains a hero to Cubans[永久失效連結]". People's Weekly World.